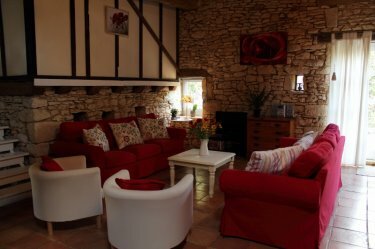 Naudy is a charming cottage with stone walls in all the rooms and massive beams throughout.It is in a small peaceful hamlet near the village of Blanquefort sur Briolance. It is only 7km from Lacapelle Biron with it's shops and facilities. It has 4 bedrooms all with bedside tables and lamps and hanging space for clothes. 2 hairdryers are provided in the double bedrooms as are travel plugs. The huge living/dining room has 2 comfortable sofas and 2 archairs seating 9 people where you can watch UK Satellite TV or French TV on the flat screen TV or watch one of the selection of DVD's. Or you could sit and read one of the many books in the bookcase or play one of the boardgames or playing cards provided. There is an iPod docking staion for your music and new for 2013 internet access. From the living room a short flight of stairs leads to the mezzanine kitchen and second double bedroom. 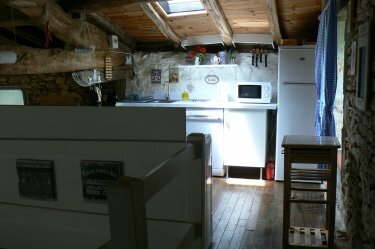 The kitchen is newly fitted and very well equipped with everything you could want for your stay including a dishwasher. Underneath the mezzinine floor is the second shower room and sweet little bedroom with childs single bed. There is a second fridge and washing machine in the inner hall with ironing board and clothes airer and ample cleaning products and equipment for guests to use. The back door opens onto a small terraced area with a table and 2 chairs and is an ideal spot for breakfast or a quiet drink. 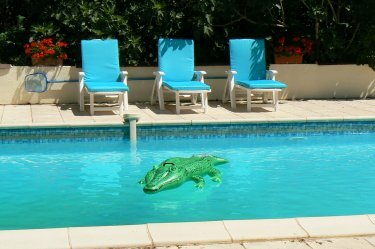 The large 11m x 5m pool is heated from April to October and has roman steps at one end for easy access a deep end and of course an alarm is fitted.It is fully enclosed for added peace of mind and security for parents of young children. The tiled terrace has 5 sun lougers with cushions for relaxing and soaking up the sun. 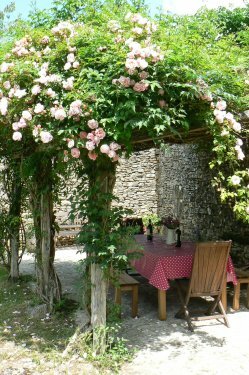 The lovely flower covered terrace has table and seating for everyone and is perfectly shaded for all your meals perhaps cooked on the stone built barbecue which is nearby. A table tennis table and badminton net and rackets are provided as are a small selection of childrens toys.There are lots of useful brochures and maps in the cottage with information on activities, gardens, chateaux and medieval villages and of course local shops and restaurants etc. For serious walkers and ramblers walking poles, back packs with thermos flasks and lunch boxes, compasses and laminated walks in French and English are provided on request at no extra charge. Private parking for 2 or more cars. Welcome refreshments on arrival....Welcome basket full of homemade goodies provided also. Prices above are for maximum occupancy of 9 people. Bookings made under 8 weeks payment in full at time of booking.